When Wild Basin was originally preserved in the 1970s, its mission was to provide an environmental education resource for the local Austin community. Today, it is considered a living laboratory, where students can learn about this native ecosystem with hands-on research and classes at Wild Basin. Students have studied a range of environmental topics at Wild Basin, including water quality, white-tailed deer density, microbes in the soil and predators in birds’ nests. Many of these research projects shed light on important questions that help us better understand the environment and ecosystem of Wild Basin. For more information on how to get in involved in ongoing research projects, email wbasin [at] stedwards.edu. 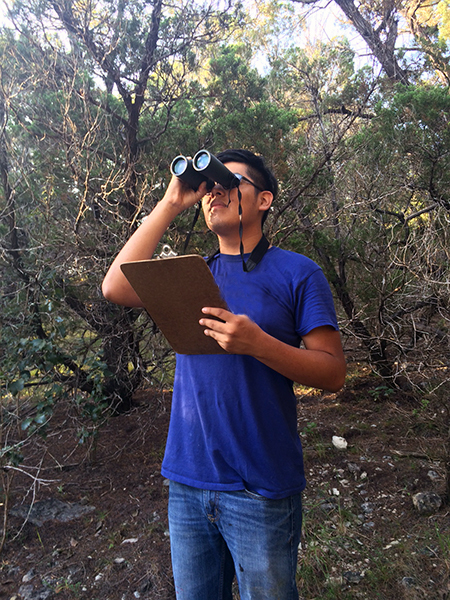 All off-trail research and education must receive a permit from Travis County prior to beginning work; please review the permit application requirements. Student researchers use drones with infrared cameras to find out what wildlife call Wild Basin their home. Wildlife: Which Species Are Here, and Where Do We Find Them? Wild Basin is 227 acres of wilderness that is surrounded by residential neighborhoods, commercial development and a major highway. The preserve is like a safe refuge for native wildlife species, but it’s difficult to know how many species are here or where they’re located because so many types of wildlife are shy around humans and hard to track. Motion-triggered wildlife cameras can help with that by taking quick snapshots when a moving animal walks in front of the camera. The cameras are set up in a grid formation across Wild Basin to help us understand how different species are distributed across the landscape. For example, researchers have found that certain species like white-tailed deer are more common near the edges of Wild Basin where they can hop the fence into nearby neighborhoods. Researchers have also found that the riparian area surrounding Bee Creek is like a highway for wildlife to travel across different habitats. There are several other methods that researchers use to study wildlife at Wild Basin, including by a drone equipped with an infrared camera. Infrared cameras can pick up on mammals’ body heat, so researchers are experimenting with this method to help count white-tailed deer and determine where they are most often found in the preserve. Other methods involve walking transects to listen for frogs and toads, using small traps to collect ant species, or standing quietly in select points to listen and look for birds. Bee Creek runs from west to east across Wild Basin. 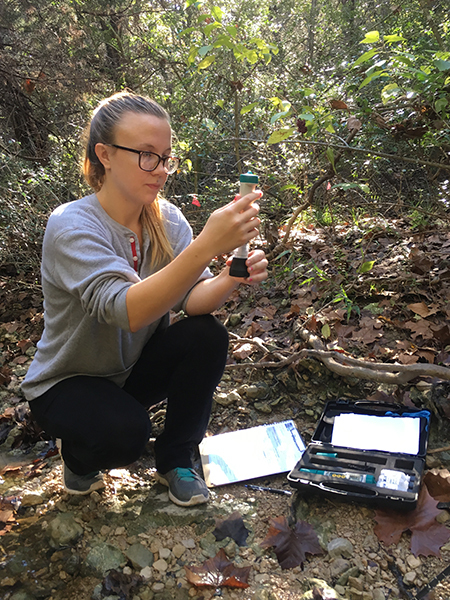 Wild Basin student interns regularly collect information about the water quality in Bee Creek, such as the dissolved oxygen, conductivity, and pH. Each of these parameters reveals important information about the health of Bee Creek and its ability to support aquatic life. In addition, students in St. Edward’s University’s Introductory Biology labs have collected samples from Bee Creek to conduct analyses on nutrient levels, such as nitrates and phosphorus. Another group of student researchers have analyzed the bacteria concentrations at 20 different locations along the creek and used DNA sequencing techniques to try to identify potential sources of bacteria. These researchers are helping to provide a more complete picture of the water quality in Bee Creek, how it changes over time, and how it changes as it meanders through Wild Basin. For example, phosphorus concentrations can be lower downstream than upstream, whereas bacteria seems to show the opposite trend. Collectively, these research projects demonstrate that water quality in Bee Creek is likely affected by a broad range of factors, including runoff from upstream sources and Loop 360 and groundwater seeping into the creek at various different points in Wild Basin. The wooded habitat of Wild Basin provides foraging and nesting resources for a variety of forest-loving bird species. Researchers at Wild Basin have been studying the bird community at Wild Basin to identify which types of species are here – cardinals, blue jays, Carolina wrens, and blue-gray gnatcatchers are just a few that you might see or hear as you’re hiking the trails. Several researchers use sound recording equipment to learn more about the bird species that live here and gather clues about their behavior. The bioacoustic information can be useful for identifying bird species (and even individual birds) and exploring questions such as whether birds change their songs when near noisy roadways or when a loud helicopter flies overhead. Researchers have also used artificial nests and motion-triggered video cameras to investigate the types of predators that visit birds’ nests and whether nests in certain parts of the preserve are more vulnerable to predation. Students have recorded videos of several nest predators at Wild Basin, including squirrels, blue jays, and Woodhouse's scrub-jays, removing eggs from artificial nests. A group of citizen scientists conducts a quarterly bird walk at Wild Basin to record all birds seen and heard along its trails. This group logs all of their observations on eBird, a citizen science database developed by Audubon and Cornell Lab of Ornithology, which makes the data available to scientists studying trends in how bird communities are changing over time and space. Their observations also help Wild Basin track historical trends in bird diversity here as the surrounding landscape becomes increasingly developed. Did you know that a small pinch of soil can contain thousands of bacteria species and millions of individual soil microbes? Researchers have been studying Wild Basin’s soils to answer a range of questions about how the microbial communities in soil support native plants and contribute to nutrient cycling such as decomposition and carbon storage. Student researchers from St. Edward’s University have examined the “root microbiome” of seven different native plants, including curly muhly, Ashe juniper, and twist-leaf yucca. They collected soil samples from the areas surrounding plant roots and used DNA extraction techniques to characterize the bacterial and fungal communities near each plant species. Another group of researchers investigated how soil microbes vary in different parts of Wild Basin – for example, they examined how soils change as you get farther away from creeks and how soils differ in areas dominated by deciduous versus evergreen plant species. Several students are currently investigating the decomposition rates in soils across Wild Basin, which can affect the cycling of carbon from soils to the atmosphere.